Now this post should really be titled ‘Applegate’ but unless you know the context (which you will by the time you’ve read the post) you may skim past it – which is why it remains titled as it does. Suffice to say an incident did occur but more of that later. 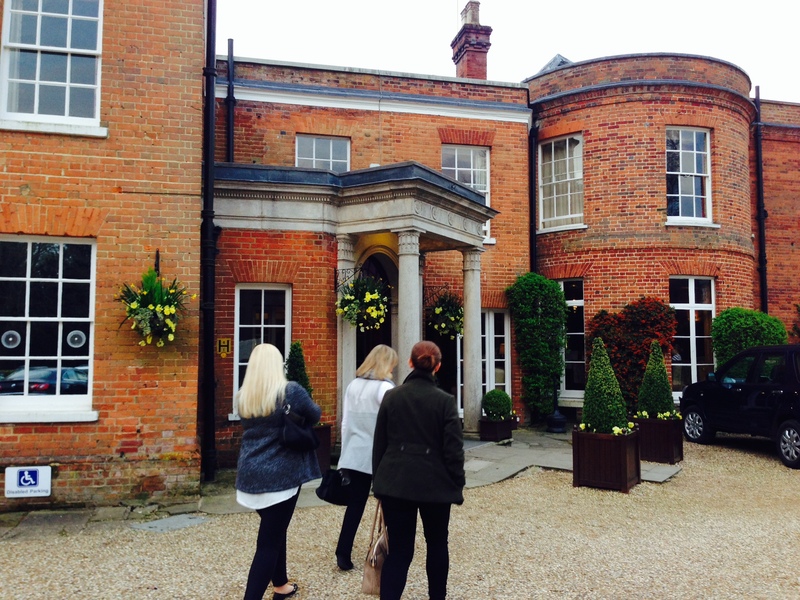 We reviewed the rather lovely ‘Fork’ when it first opened which you can read here. Our reason for returning (apart from it being one of our favourite local sundowner venues) was the temptation of burgers being added to the Grill menu. Now who doesn’t love a burger? 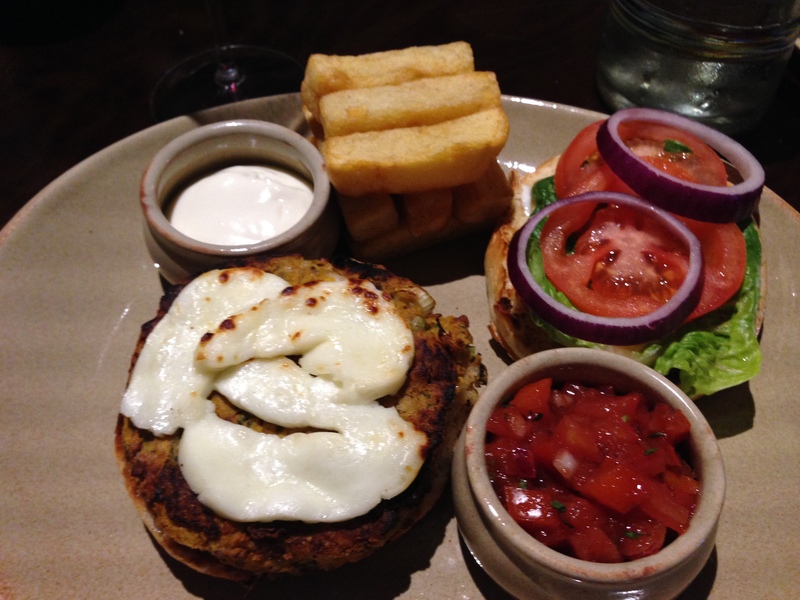 As you know, our esteemed MD is a vegetarian, so we were doubly delighted to see a veggie burger popping up on the list! The Royal Berkshire comes into its own at this time of year, with waving daffodils in the grounds highlighting the intense citrus coloured loungers on the lush lawns. After a hydrating Hendricks and tonic in the warm and friendly bar, we settled ourselves into the incredibly comfortable tub chairs around our table in Fork and set to work. I’ll rattle through the starters as we have reviewed them before – but will stop to pay homage to the BBQ Steak with Applewood cheese, roasted onion and confit garlic. Apart from it being a truly terrific starter, it also plays a part in our final conclusion of which dishes we highly recommend you choose when dining here. On with the burgers (it was a pre-requisite that we all had to have burgers for sake of this post) and of the five of us, Tess and Andrea both chose the Veggie burger, Ali had the Beefburger topped with mature cheddar and bacon, Vicky had the Beefburger sans cheese, and I had Beef and Chorizo burger. 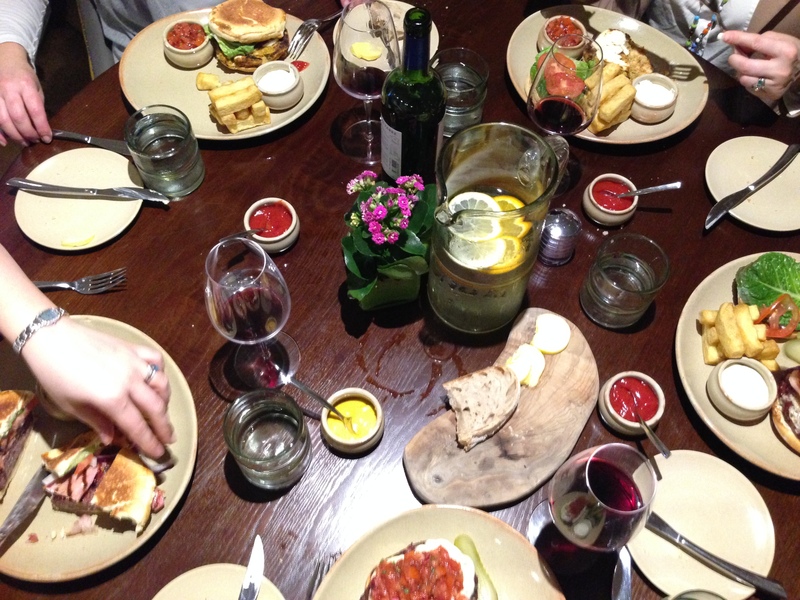 All the burgers are served open on a toasted brioche bun with Fork’s famous jenga chips. This was where the fun started. I can only describe what happened next as being like a family card game of Slam (or Spit as it is also known) as those round the table fought to shed their gherkins off of their buns as fast as possible to willing takers. I ended up shrieking ‘STOP!” and made them all return their plates to original forms as I had not photographed them yet! With the gherkin shirkers relieved and the gherkin lovers happy as Larry, we then commenced with the ‘cut-through’ photo’s before we endeavoured to build our buns and start chomping. 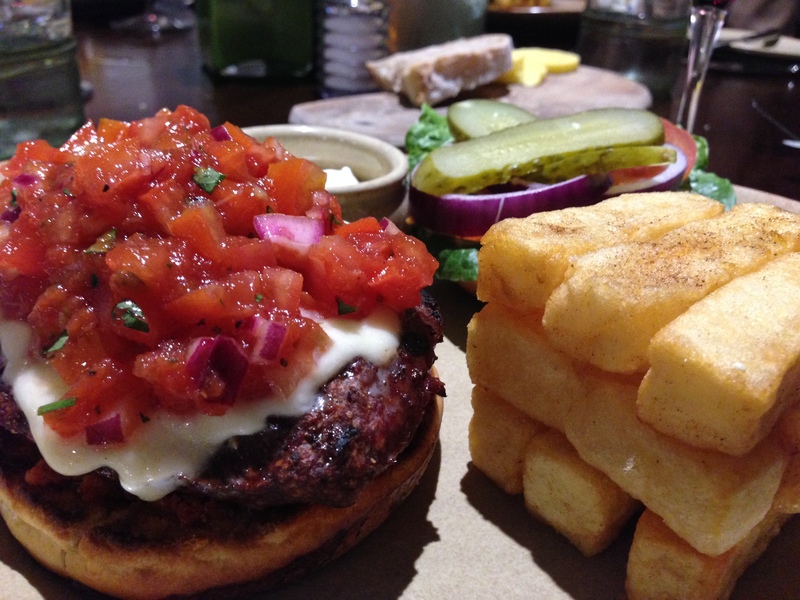 I will start with my own Chorizo burger as seen in the main image. 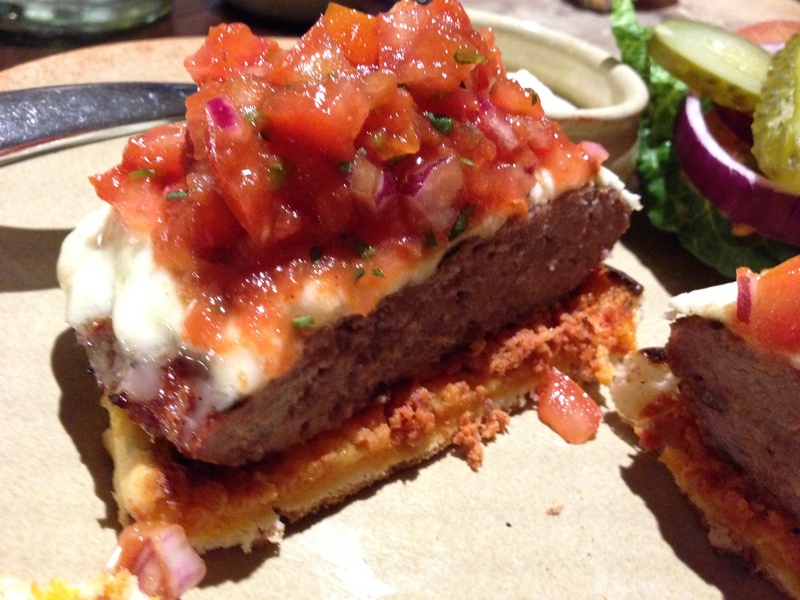 The tomato salsa piled high dissuaded me from putting my top on the burger so I cut it in half as I was intrigued to see where the chef had hidden the chorizo. It was actually spread on the bottom of the bun under the burger in an almost pate like form. This worked well as you got the hit of sweet spice without having to chomp through another layer of meat. After we’d eaten Chef Nicky explained they had tried incorporating the chorizo in the burger but it made the patty shrink so this seemed the best option. I agree. She also rushed to apologise for missing the Jalapenos off but to be honest the salsa had a good enough kick that I hadn’t actually noticed! A discussion followed where we challenged Vicky as to why she had no cheese on her burger and she didn’t have a proper answer – just that she didn’t do cheese and meat. Good job she doesn’t ski. She did however polish off her burger faster than anyone else and attempted to eat it with both top and bottom bun – impressive skills. Ali had the burger ‘fully loaded’ and I have to say I had bacon envy. She agreed it was a necessary part of the experience and also declared she’d have the same choice again. We all found the beefburgers themselves to be wonderfully meaty without being too ‘beefy’ as some high grade burgers can be. They had a really pleasing tight texture and were just the right shade of pink inside, so full marks for the meat. Now as we had two veggie burgers on the table I was lucky enough to be offered a taste and it was NOT what I was expecting at all! I associate veggie burgers with falafel – dry, slightly spicy and usually made of some kind of pulse or pea. Not this one. I have the recipe in front of me and can quote butternut squash, polenta, spring onion, celeriac, pecan nuts, grated parmesan and chopped herbs. The celeriac lent a wonderful root veg flavour, while the pecans added a sweet nutty crunch and the parmesan a salty richness that all added up to a mouthful of utter deliciousness. That was all I was allowed but we sat and listened to Tess and Andrea coo and sigh over their plates. The addition of haloumi however proved the stumbling block. Though both of them are big squeaky cheese fans they jointly decided that the haloumi topping was not strong enough to shout over the full flavours of the burger. Tess would have liked blue cheese. Andrea, (and this brings me back to an earlier point) came to the conclusion that the Applewood cheese that she’d had with her steak starter would be the winner for her as it went so well with the beef. After a brief pause to discuss and digest we decided it would be rude not to finish off with Fork’s signature pudding, Fairground Plate, and this is when the incident happened or ‘Applegate’ as it is now known. 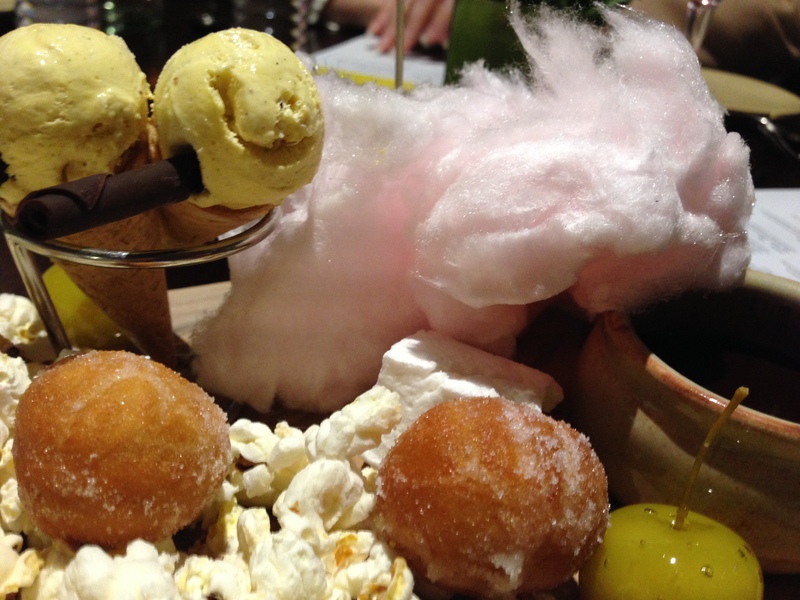 The sharing plate consists of a variety of tiny forms of treat including ice-cream cones, doughnuts and toffee apples. I got a bee in my bonnet about the toffee apple being an altogether different fruit pretending to be a tiny apple. Andrea in despair called our very charming waiter over and asked him what it was. He looked slightly puzzled and quite rightly said “ahhh…mini toffee apple?”. Except what Tess heard was “Ar…menian toffee apple” so when Andrea then pressed for the variety Tess turned and said with authority, “He just told you, they’re Armenian!”. After a stunned paused, the sugar in our veins from the pudding got to work and as the penny dropped for Tess, the hysteria moved almost visibly around the table. By the time it got to Vicky she was laughing so hard she couldn’t actually breathe and had to leave the table. I honestly thought the table would rise up to the ceiling like the afternoon tea scene in Mary Poppins. It took us a good ten minutes to regain control and for that we wholly apologise to restaurant manager Moin who was looking after us and our waiter who must think we are utterly mad. Now – back to burgers. Our rather surprising conclusion actually came straight from the Chef’s mouth. 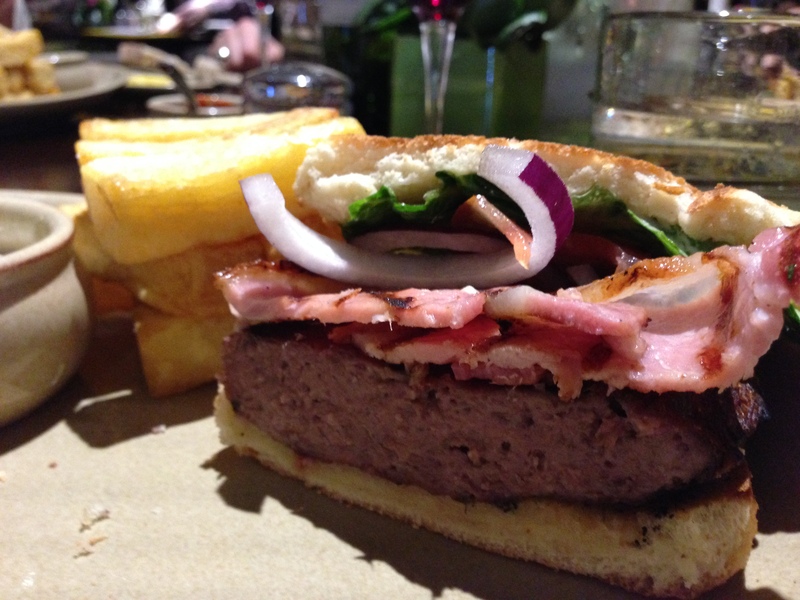 Chef Nicky revealed that the team in the kitchen’s favourite combination when it came to the burgers was in fact the veggie burger… topped with bacon. Now veggies may accuse the carnivores of being able to have their cake and eat it but this hit a distinct chord with three of us as we sagely nodded at this frankly genius combination. So, the veggie burger topped with Applewood cheese and bacon puts us in burger heaven. Vegetarian food adapted for carnivores rather than the other way round? Could catch on! Both beefburgers with accompaniments £13.95. Veggie burger £12.95. Design Restaurant members dine complimentary at Fork when joined by at least one full paying guest for dinner Sunday to Thursday. For booking details click here. Not a member? Why not try our £10 trial membership? Download our app for free at www.designrestaurants.com and follow the instructions on screen.